ShawnM wrote: Since I showed you mine you have to show me yours. Thanks for sharing. There are actually a few early SportCruisers with your same EFIS. To answer some of your questions, yes I can push frequencies from my 660 to my radio. My radio is the GTR-200, not the 225. The 225 is the TSO’d version. The fact that the radio is linked to the GPS also allows the radio to show me the 10 closest airports and frequencies if I’m ever in a unfamiliar area. Kind of like a “nearest” feature. A nice feature also. 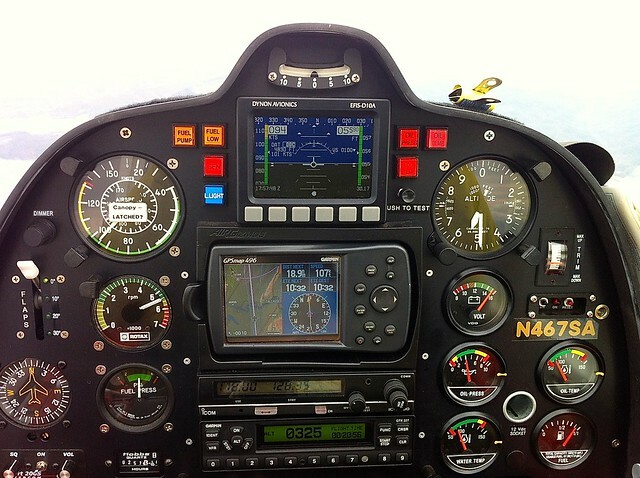 And yes, the D-120 offers engine data logging and retrieval via the Dynon Support Program. You can also stream real time engine data to an external serial device for recording if you want. In your situation I’d prefer the ability to push frequencies to the SL-30 rather than sending the GPS data to my ELT. You would use this feature more, yes? Since you obviously have a 406 ELT that alone is far better in location accuracy even without GPS coordinates than the old 121 ELT’s. I’d pass on sending it GPS data and rather have the ability to input frequencies into my radio. A feature I use every time I fly. Just my opinion. To help put you mind at ease about not sending gps data to the ELT, the new 406 versions alone without GPS input are using doppler shift technology and the satellites will usually determine your position within 2 nautical miles on the first pass and improve upon that with each subsequent pass of the satellite. Not to mention you just added ADS-B out so ATC will know where you are also. Your 406 unit also sends a lot of data about you and your plane to the satellites that also help in locating you. My point being sending GPS data to a 406 ELT is optional and something I personally would sacrifice in order to send frequencies to my radio. I feel the 406 ELT is far superior in location information than the old 121 units and feel comfortable in knowing they’ll find me quickly. Not everyone may feel this way. We can talk ELT in another post as to not hijack this one. Thanks for sharing your panel with me. Thanks for sharing Paul, I see you have the fancy new Skyview goodies. ShawnM wrote: Thanks for sharing Paul, I see you have the fancy new Skyview goodies. Yep. Including their 2-axis autopilot, blind Mode S- ES transponder. and dual-band wx and traffic rcvr for a complete installed ADS-B in/out 2020 solution. Not the cheapest way to go, but nice high level of integration. Kind of basic, but the little 496 all by its lonesome is SO much more than what served us greybeards for many decades, that I feel blessed to have it. And combined with an iPad or iPhone is more than enough to navigate to virtually anywhere in the US. Anyway, gets the job done! Well Eddie you got pretty much everything there , an EFIS , a gps ... just in a smaller package ..
Warmi, did you really just say that Eddie has a smaller package? At least my hands are normally sized! So.......I really like the Sling and the Sling panel....courtesy of Midwest Sky Sports...(they are the best). Ok, back to our regular scheduled programming. Wings are now attached, winglets installed, flaps and ailerons complete, panel waiting on Garmin glass, center console looking good, Rotax 912 ULS should arrive in a couple of days. We are hoping to fly by the end of September. Maybe even fly it home to Florida by end of September. This is so much fun. Another great day of riveting...LOTS of rivets! Lots of work on the luggage compartment and flight controls today. My reward for 10 hours of riveting was a spin around the patch in the MSS Sling 2 with one of the MSS pilots!! IT IS A BLAST. The visibility is awesome. The situational awareness from G3X Touch is unbelievable. The auto-pilot is great. But, the best part is the way the Sling 2 feels when hand-flying...it's perfect. Period. We had a nice rainbow too!